Various genetic and environmental factors appear to be involved in systemic lupus erythematosus (SLE). Epstein–Barr virus (EBV) is among the environmental factors that are suspected of predisposing to SLE, based on the characteristics of EBV itself and on sequence homologies between autoantigens and EBV antigens. In addition, higher titers of anti-EBV antibodies and increased EBV seroconversion rates have been observed in SLE patients as compared with healthy control individuals. Serologic responses do not directly reflect EBV status within the body. Clarification of the precise status of EBV infection in SLE patients would help to improve our understanding of the role played by EBV in this disease. In the present study we determined EBV types in SLE patients (n = 66) and normal control individual (n = 63) by direct PCR analysis of mouthwash samples. We also compared EBV load in blood between SLE patients (n = 24) and healthy control individuals (n = 29) using semiquantitative PCR assay. The number of infections and EBV type distribution were similar between adult SLE patients and healthy control individuals (98.5% versus 94%). Interestingly, the EBV burden in peripheral blood mononuclear cells (PBMCs) was over 15-fold greater in SLE patients than in healthy control individuals (mean ± standard deviation: 463 ± 570 EBV genome copies/3 μg PBMC DNA versus 30 ± 29 EBV genome copies/3 μg PBMC DNA; P = 0.001), suggesting that EBV infection is abnormally regulated in SLE. The abnormally increased proportion of EBV-infected B cells in the SLE patients may contribute to enhanced autoantibody production in this disease. Systemic lupus erythematosus (SLE) is an idiopathic disease characterized by variable inflammatory destruction. A variety of autoantibodies are found in the serum of SLE patients, indicating that SLE is an autoimmune disease . However, the mechanisms that lead to the aberrant autoimmune responses are not clearly understood, and various genetic and environmental factors are thought to be involved . Epstein–Barr virus (EBV) is suspected to play a role in predisposing to SLE for several reasons. First, EBV promotes proliferation of B cells after infection, and thus it poses a prolonged antigenic challenge. This prolonged EBV antigen expression may trigger SLE in genetically prone individuals. Second, EBV-infected B cells can become a continuous source of autoantibodies. Third, sequence homologies exist between SLE autoantigens and some EBV proteins, such as EBV nuclear antigen (EBNA)-1 and EBNA-2. The antibodies elicited by these viral antigens may cross-react with autoantigens and trigger SLE [3–5]. If EBV is indeed involved in the pathogenesis of SLE, then there must be some association between EBV infection and SLE [6–9]. Elevated titers of anti-EBV antibodies have been detected in SLE patients compared with control individuals [10–12]. It is difficult to prove that there is any association between EBV and SLE by comparing seroconversion rates between patients and healthy control individuals because the majority of adults are seropositive for EBV . Recently, James and coworkers [14, 15] examined more than 100 SLE patients and found that the EBV seroconversion rate was significantly greater in SLE patients than in normal control individuals, both in young and adult populations. However, these studies do not prove the existence of a temporal relationship between EBV infection and development of SLE. In addition, measuring antibodies to EBV antigen does not directly indicate the status of EBV within the body. This is because the serologic response can be affected not only by the nature of an antigen but also by immune dysregulation induced by a patient's underlying disease or treatment. Recent reports [16, 17] indicated that some individuals developed SLE immediately after an EBV-induced infectious mononucleosis, which supports the hypothesis that EBV infection could trigger at least some SLE cases. Hence, clarifying the precise status of an EBV infection in patients would be valuable in improving our understanding of the role played by EBV in the pathogenesis of SLE. There have been few reports of EBV loads or EBV types in SLE patients. Individual EBV isolates are classified into type 1 and type 2, based on polymorphisms in their EBNA-2, EBNA-3A, EBNA-3B, and EBNA-3C genes . All virus isolates can be typed at the DNA level by PCR amplification across these polymorphic regions . Different types of EBV produce antigens with different immunogenicity , and T-cell immunity may be affected by EBV type. Because an EBV-specific cytotoxic T-cell function appears to be impaired in SLE patients , it is possible that SLE patients are infected with a specific type of EBV. In the present study we determined EBV types in SLE patients and normal control individuals by direct PCR analysis of mouthwash samples. We also compared EBV loads in blood between SLE patients and healthy control individuals using a semiquantitative PCR assay. Sixty-six Korean patients with SLE treated at the Department of Internal Medicine (Kangnam St. Mary's Hospital, Seoul, Korea) participated in the study. Diagnosis of SLE required fulfillment of at least four of the American College of Rheumatology criteria . Sixty-three healthy volunteers were also recruited for comparison (control group). The age (mean ± standard deviation) was 45.7 ± 15.6 years for the normal control individuals and 38.5 ± 10.8 years for the SLE patients. In order to characterize EBV infection, mouthwash samples were collected from the participants after 45 s of gargling with 13 ml sterile phosphate-buffered saline. To measure EBV burden, peripheral blood samples were collected from some of the participants (24/66 SLE patients and 29/63 healthy volunteers). Informed consent was obtained from all participants recruited into the study. BJAB is an EBV-negative Burkitt's lymphoma cell line. ES-1, B95-8, LCL2, M.2, SNU-99, AG876, and Namalwa are EBV-transformed cell lines. All cells were grown in RPMI-1640 medium supplemented with 10% fetal bovine serum (Gibco BRL, San Diego, CA, USA), 100 U/ml penicillin, and 100 μg/ml streptomycin at 37°C in 5% carbon dioxide. Mouthwash samples were centrifuged at 3000 rpm for 10 min to remove cell debris, and the supernatant was centrifuged again at 15,000 rpm for 40 min. EBV DNA was obtained from the pellet by lysing it in 250 μl lysis buffer (10 mmol/l Tris-HCl, 1 mmol/l EDTA, 2% SDS, 1 mg/ml proteinase K) overnight at 55°C. The samples were then extracted with phenol/chloroform and DNA was precipitated with ethanol. DNA from a mouthwash sample was dissolved in 40 μl TE buffer, and 2 μl was used for each PCR reaction. Peripheral blood mononuclear cells (PBMCs) were obtained from blood samples by centrifugation over a cushion of Ficoll-Hypaque (Amersham Pharmacia Biotech, Uppsala, Sweden), as described previously . Genomic DNA was prepared from cultured cell lines or PBMC samples by boiling in 0.2× phosphate-buffered saline and digesting with proteinase K (1 mg/ml) overnight at 55°C. The samples were then extracted with phenol/chloroform and DNA was precipitated with ethanol. The extracted DNA was quantified on a spectrophotometer and 3 μg DNA was used for each PCR reaction. The type of EBV was determined by PCR amplification across the polymorphic regions of EBNAs (EBNA-2, EBNA-3B, and EBNA-3C), as previously reported . The sequences of the primers and the expected PCR product sizes are listed in Table 1. For every PCR reaction, a 20th of the purified DNA from a mouthwash sample was used. PCR was performed in a total volume of 10 μl, which contained 2 μl extracted DNA sample, 1 μl 10× PCR buffer (with 100 mmol/l Tris-HCl, 500 mmol/l KCl, and 15 mmol/l MgCl2), 2 μl primer pair mix, and 1 U Taq polymerase (Takara, Tokyo, Japan). The remaining volume was filled with distilled water. The final concentration of each primer was 0.25 μmol/l. EBNA, Epstein–Barr virus nuclear antigen. Amplification was performed using a thermocycler (model 9600; Perkin-Elmer Corporation, Foster City, CA, USA) under the conditions shown in Table 1. DNA extracted from Namalwa (type 1) and AG876 (type 2) cell lines were used as type-specific EBV-positive controls. DNA purified from BJAB was used as a negative control. PCR products were subjected to electrophoresis on a 2% agarose gel. Southern transfer onto a Hybond-N+ nylon membrane (Amersham Pharmacia Biotech) was performed to increase the sensitivity of detection and to authenticate the PCR-amplified product. The blot was UV cross-linked (Spectronics Corporation, Westbury, NY, USA) and processed to detect PCR products using an EBNA-3C-specific probe (Table 1) and an ECL 3'-oligolabelling/detection system (Amersham Pharmacia Biotech). EBV burden in the blood of SLE patients was assessed by EBNA-3C-specific PCR/Southern blot using the DNA purified from PBMCs. DNA from Namalwa cells, which contains two EBV genome copies per cell [22, 23], was used to prepare a standard curve and to determine the sensitivity of the assay. Serial 10-fold dilutions of Namalwa cells (corresponding to 1 to 1 × 107 cells) were mixed with BJAB cells to yield a total cell number of 1 × 107. DNA was isolated from these cell mixtures by phenol/chloroform extraction followed by ethanol precipitation. To control for variation in PCR efficiency, PCR was performed for serially diluted Namalwa DNA in parallel with sample DNA. PCR products were analyzed by 2% agarose gel electrophoresis and were Southern blotted onto a Hybond-N+ nylon membrane (Amersham Pharmacia Biotech). After blotting, DNA was UV cross-linked. Probe labeling and hybridization were carried out using an ECL 3'-oligolabelling and detection system (Amersham Pharmacia Biotech). For objective evaluation, Southern blot results were analyzed on an image analysis system (Amersham Pharmacia Biotech). Results obtained from serially diluted Namalwa cells were used to prepare a standard curve. The density of each sample was measured and the EBV copies were deduced by interpolating on the standard curve. Fisher's exact test was used to compare the EBV infection rates between SLE patients and healthy control individuals. P < 0.05 was considered statistically significant. The Mann–Whitney U rank sum test was used to compare EBV loads between patients and healthy control individuals. Spearman correlation analysis was performed to determine bivariate correlations. To detect EBV infection and to determine the type of infecting EBV, DNA from the mouthwash samples were subjected to PCR/Southern blot across the polymorphic region of the EBNA-3C gene. Before testing the samples, the specificity of this method was examined using a panel of six different EBV-infected cell lines of known EBV type. As expected, the EBNA-3C-specific PCR yielded products with different sizes depending on EBV type: a 153 bp product for type 1 EBV and a 246 bp product for type 2 EBV (Fig. 1a). Epstein–Barr virus (EBV) typing of normal individuals and patients with systemic lupus erythematosus (SLE) in mouthwash samples. 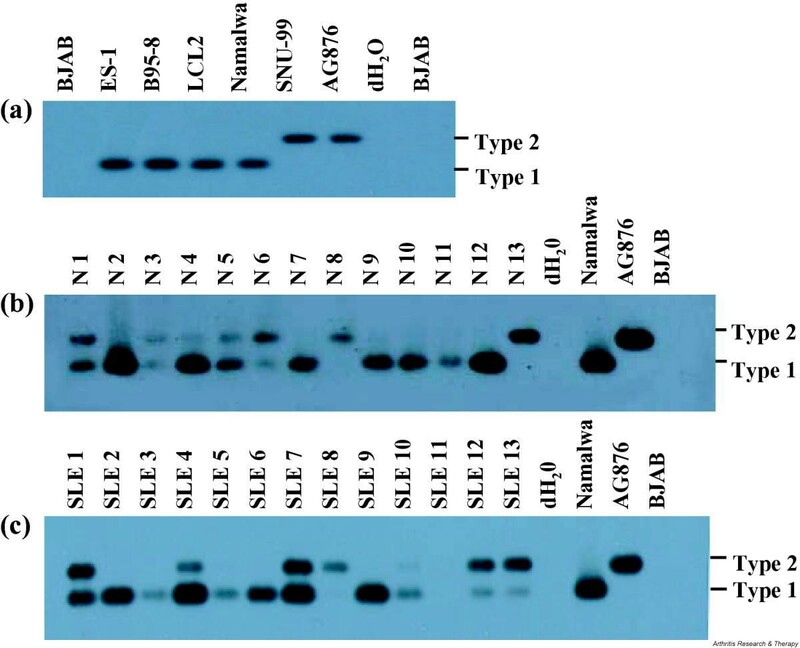 (a) PCR/Southern blot of the EBV nuclear antigen (EBNA)-3C encoding region for the cell lines carrying type 1 (ES-1, B95-8, LCL2, and Namalwa) and type 2 (SNU-99 and AG876) EBV. DNA extracted from each EBV infected cell line (5 ng) was subjected to EBNA-3C-specific PCR/Southern blot. PCR amplified products were transferred to a membrane and hybridized with an EBNA-3C probe common to both type 1 and type 2 EBV. The expected PCR product sizes were 153 bp for type 1 EBV and 246 bp for type 2 EBV. The EBV negative cell line BJAB and distilled water served as negative controls. (b,c) PCR/Southern blot of the EBNA-3C encoding region for the DNA from mouthwash samples. One 20th of the DNA isolated from mouthwash samples was used for each PCR reaction. Representative results obtained from normal controls (panel b) and SLE patients (panel c) are shown. Namalwa and AG876 were used as positive controls for type 1 and type 2 EBV, respectively. Distilled water (dH20) and DNA isolated from BJAB were used as negative controls. The mouthwash samples from 63 control individuals and 66 SLE patients were evaluated for EBV infection. Representative results are illustrated in Fig. 1b,1c. Some individuals were singly infected with either type 1 or type 2 EBV, whereas some were co-infected with both types of EBV. Collectively, among the 63 healthy volunteers, 22 were infected with type 1 EBV, four were infected with type 2 EBV, 33 were infected with both types of EBV, and four were negative for EBV infection (Table 2). For the 66 SLE patients, 26 carried type 1 EBV, three carried type 2 EBV, 36 had dual carriage, and one was negative for both types of EBV (Table 2). To reconfirm the EBV types detected by EBNA-3C PCR, PCR amplification across polymorphic regions of EBNA-2 and EBNA-3B genes was carried out using the type-specific primers listed in Table 1. Representative results for EBV DNA detection using the mouthwash samples from healthy individuals are shown in Fig. 2. Identical EBV type was detected for each individual by EBNA-2, EBNA-3B, and EBNA-3C-specific PCR, showing that the results obtained by EBNA-3C PCR are credible. Reconfirmation of the Epstein–Barr virus (EBV) typing results. The mouthwash samples were analyzed by PCR/Southern blot for EBV nuclear antigen (EBNA)-2 and EBNA-3B in addition to EBNA-3C sequences. Namalwa and AG876 were used as positive controls for type 1 and type 2 EBV, respectively. Distilled water (dH20) was used as a negative control. DNA purified from PBMCs was used to determine the EBV burden by EBNA-3C-specific PCR/Southern blot. Serial dilutions of Namalwa DNA were used to establish the sensitivity of the assay system (Fig. 3a). The expected 153 bp signal was detected even on the lane loaded with DNA from a single Namalwa cell. The results show that this method is highly sensitive and capable of detecting as few as two copies of EBV genome in a background of 105 cells (Fig. 3a). Epstein–Barr virus (EBV) loads in peripheral blood mononuclear cells (PBMCs) from 29 normal individuals and 24 patients with systemic lupus erythematosus (SLE). (a) Sensitivity of PCR/Southern blot for the EBV nuclear antigen (EBNA)-3C sequence. 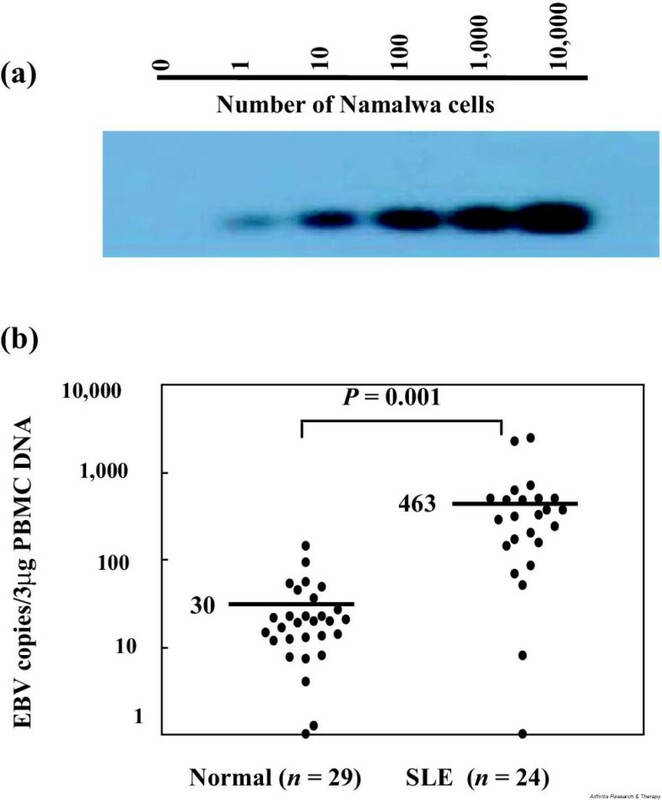 DNA was purified from serial 10-fold dilutions of Namalwa cells (corresponding to 1 to 1 × 107 cells) were mixed with BJAB cells to yield a total cell number of 1 × 107. PCR was performed using a 100th of the purified DNA (corresponding to DNA of 105 cells). The PCR products were separated in an agarose gel, transferred to a membrane, and probed with an EBNA-3C-specific oligonucleotide. (b) EBV loads of normal individuals and SLE patients. The mean EBV load of each group is presented as a heavy horizontal line. DNA from PBMCs of 24 SLE patients and 29 healthy individuals was analyzed to quantify EBV loads. To obtain more accurate data using a semiquantitative PCR method, the PCR reaction was stopped before it reached a plateau state. In addition, serially diluted Namalwa DNA solutions were included for every set of PCR experiments to control for variation in PCR efficiency. Duplicate PCR/Southern reactions were performed for each sample, and the average values are expressed as EBV genome copies/3 μg PBMC DNA (Fig. 3b). In the healthy individuals, the mean EBV load was 30 copies/3 μg PBMC DNA (range 0–141 copies/3 μg PBMC DNA). By contrast, in the SLE patients the mean EBV burden was 463 copies/3 μg PBMC DNA (range 0–2440 copies/3 μg PBMC DNA). The difference in EBV burden between SLE patients and healthy volunteers was statistically significant (P = 0.001). The median EBV levels for healthy individuals and SLE patients were 19 and 322 EBV genome copies/3 μg PBMC DNA, respectively. To test whether the increased EBV load in SLE patients was the consequence of an immune suppressive drug treatment, we divided SLE patients into two groups: those under immunosuppressive therapy, including high-dose steroid hormone treatment (n = 8); and those receiving low-dose steroid hormone and/or hydroxychloroquin (n = 16). EBV loads were similar for these two groups (mean ± standard deviation: 258 ± 190 EBV genome copies/3 μg PBMC DNA versus 461 ± 610 EBV genome copies/3 μg PBMC DNA; P = 0.327, by Spearman's test). In addition, there was no significant correlation between SLE disease activity index loads (data not shown). Also, there was no difference in EBV load between patients with and without nephritis (data not shown). For each individual from whom we could collect both samples, the EBV type detected in the blood sample was identical to that in the mouthwash sample (data not shown). The present study was undertaken to examine the types of EBV infecting SLE patients and their viral loads. Different EBV types were easily recognized from mouthwash samples by PCR. In healthy control individuals the numbers of single infections with type 1 or type 2 EBV, as well as numbers of co-infection with both types of EBV, were similar to those described previously [24–26]. Interestingly, there was no significant difference in EBV type distribution in SLE patients and normal control individuals. Thus, a specific type of EBV in SLE patients does not appear to be responsible for the abnormal T-cell reaction to EBV . We used a semiquantitative PCR assay to evaluate the level of EBV genome in the peripheral blood of SLE patients. We could detect and quantify EBV DNA in almost all of the patients with SLE and the control individuals. The SLE patients had EBV loads in PBMCs that were more than 15-fold those in normal control individuals. The EBV loads we observed in healthy volunteers are comparable to those reported by others using a real-time PCR method . The reason for the elevated EBV burden in SLE patients observed in the present study is not clear. We did not test whether T-cell function was impaired in the SLE patients, as has previously been reported . Instead, we compared EBV loads between patients with and without strong immunosuppressive therapies, including high-dose steroids. No difference was observed between the two groups of SLE patients in terms of EBV load, suggesting no direct effect of immune function on EBV load. The increased EBV burden may cause SLE by stimulating autoantibody production because of the sequence homology between autoantigens and EBV proteins [3–5]. The increased EBV loads in SLE appear to be consistent with the finding that SLE patients often have what appears to be a primary or reactivated EBV serologic response [28–30]. Approximately 1 in 105–106 B cells are latently infected with EBV in healthy carriers, and one EBV-infected cell usually contains about 30 EBV episomes [31, 32]. Because one human genome contains approximately 6 pg DNA, the 3 μg PBMC DNA used in our PCR reaction corresponds to 5 × 105 blood cells. Thus, it is not surprising that EBV genome was detected in almost all PBMC samples, bearing in mind that the sensitivity of our PCR assay was two copies of EBV genome (Fig. 3a). Furthermore, only one out of 63 SLE patients (1.5%) was EBV-negative, whereas four out of 66 normal control individuals (6.0%) were EBV-negative when DNA from the mouthwash sample was tested. Even though there was a tendency toward increased EBV infection rate among SLE patients, this difference did not reach statistical significance. Our findings are different from those of one study  in which 13 SLE patients were tested by PCR; that study found no detectable EBV genomes in PBMC DNA or concentrated saliva, even though all of the patients exhibited EBV seroconversion. Another group of researchers also reported very low rates of EBV positivity for SLE patients (2/20) and normal control individuals (0/20) using PCR/Southern methods . The discrepancy between reported data and our findings may be due to the sensitivity of the PCR assays used. The sensitivities of the PCR assays used to detect EBV-infected cells was 80 copies in one case  and 1 pg B95-8 DNA in the other . When James and coworkers  evaluated EBV infection in PBMCs from young SLE patients by PCR analysis, 100% of the SLE patients were EBV-positive whereas only 72% of the matched control individuals were EBV-positive (P < 0.002). Those investigators needed to recruit young SLE patients (average age 15.8 ± 2.2 years) in order to achieve sufficient statistical power in their study, because about 95% of adults are presumed to carry EBV . However, the patients who participated in the present study were considerably older (average age 38.5 ± 10.8 years), and statistically significant differences in EBV infection rates between SLE patients and normal control individuals might not have been detected because of the relatively old age and small numbers of patients recruited into our study. EBV has been suspected of being an etiologic agent not only for SLE but also for other autoimmune diseases. Sera from patients with rheumatoid arthritis contain more antibodies to EBV than do sera from healthy control individuals . Furthermore, patients with rheumatoid arthritis have a decreased T-cell response to EBV gp110 [36, 37]. We  and others  found that patients with rheumatoid arthritis have elevated EBV loads in their peripheral blood. EBV is also frequently detected in salivary glands from patients with Sjögren's syndrome . In addition, spontaneously transformed B-cell lines producing a large amount of transforming EBV were preferentially established in Sjögren's syndrome patients, probably because of impaired EBV-specific regulatory mechanisms in this disease . After we had submitted our manuscript, Kang and coworkers  reported that EBV titer in SLE was increased by about 40-fold that in normal control samples. They also showed that the EBV loads were unaffected by immunosuppressive therapies, as we observed. Because they used real-time PCR to detect EBV loads in PBMC DNA, the small difference between their data and ours may be due to the semiquantitative nature of the PCR assay we used. The type of EBV infecting adult SLE patients is not different from that in healthy control individuals. However, many patients with SLE have elevated EBV load in their blood, suggesting that EBV infection is abnormally regulated in SLE. The increased numbers of EBV-infected B cells in SLE patients may contribute to an enhanced autoantibody production in this disease. Uk Yeol Moon, Su Jin Park contributed equally to this work. This work was supported by a grant (R11-2002-098-04006-0) from the Korea Science & Engineering Foundation through the RRC (Rheumatism Research Center) at the Catholic University. We are grateful to Young Shik Shim and Sun-A Lee for their valuable technical support.